Lime citrus gives this zippy sauce its pizazz and sets it apart from the typical bottled brand you can buy in any store. Last week I shared with you a recipe for Hawaiian Pineapple Cake I recently made that called for a can of crushed pineapple — juice reserved. 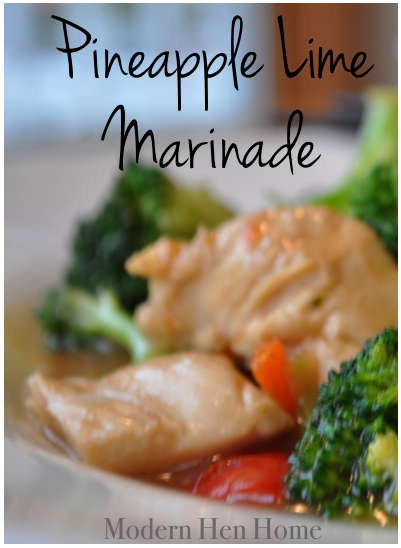 Well, I saved mine to make this amazing marinade for an out of this world zesty chicken and vegetable stir-fry. I’ll post that recipe soon, but in the meantime go ahead and whip this sauce on tonight’s tenderloins and let it do its magic. Then grill, saute or bake it — whatever your hearts desire — and enjoy! Keep this one in mind to use on pork and shrimp, too! In a medium saucepan combine all ingredients except for chicken and heat, removing just before boiling. Cool completely. Place chicken breast tenderloins in a dish and smother with marinade. Refrigerate for at least 30 minutes, or up to overnight (the longer the better), then grill, saute or bake — your preference. Options: To use any leftover marination sauce, simply cook it in a small pan by bringing it up to a rolling boil and heat on high for about 10 minutes (stay with it). Turn the temperature down to simmer making sure it’s cooked through or reaches 165 degrees if you have a food thermometer. Pour prepared sauce over the cooked chicken or serve on the side in a small bowl. Finally, squeeze fresh lime juice over the finished dish just before serving. Stay with me this week — I’ll be back with some fun holiday decorating photos from around our house, and if time is on my side, a few tips for making these Sofa Slipcovers from Drop Cloths.